Mark files and folders , through change their face ,and add description to them. The description you add will appear in the explorer popup windows. Description also available in the Windows explorer columns (NOT supports in Vista and 7). You will also be able to see a full content and size of files and subfolders in a popup window for a folder. UserInfoTip is very easy to use. Install it and then click on a file or a folder. 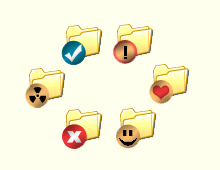 UserInfoTip - marks files and folders and adds description for them. * The utility is very easy to use. Install it and then click on a file or a folder. Select "Manage description" and that's it. * Marked files are easier to be visually found among other files. It is also easy to see a certain file type depending on the mark. * A short or an extensive description allows to know what is in the file without opening it. * A full folder content can also be seen if you like. System requirement: WinXP, Win2000, Win2003, Vista, Windows7. Qweas is providing links to UserInfoTip 2.3 as a courtesy, and makes no representations regarding UserInfoTip or any other applications or any information related thereto. Any questions, complaints or claims regarding this application UserInfoTip 2.3 must be directed to the appropriate software vendor. You may click the publisher link of UserInfoTip on the top of this page to get more details about the vendor.